The rest of this week…. This week we have been hectic with Christmas preparations. We’ve made presents for all of the girls in the family, all 12 of them. A photo of that will definitely follow!!! Caitlin and Noah have been working hard on the grandparents presents…which I’m actually really pleased with. They are turning out much better than I imagined……and not far to go until they are finished and I might share with non-family members!! Last weekend we went to a Christmas fair and saw Father Christmas…. Caitlin froze and then burst into tears, real hysteria/breath stopping tears so that wasn’t really very good! He was a bit forceful though insisting she joined in the photo as it was Austin’s first visit!! We are booked in for a proper visit next week lets hope thats more successful!!!!!! This Saturday Caitlin went to a birthday party for a little boy in her class. It was a very structured party but Caitlin had a great time!!! I’m sure we’ve done other things but this blogging days after the event is no good for someone with no memory!!!!!! Austin is half a year old!! Time has gone so quickly!! He is massive…… he is lazy….he is very content! He spends all of his time just reclined watching Caitlin and Noah playing. He can’t sit yet, he doesn’t even seem close. Today I took him to be weighed at the baby clinic at the new house and the health visitor said sit him on the scales. I replied that he couldn’t sit yet and she seemed very shocked! I then said he’s not as old as he looks….he’s only 6 months today. Good job I’m not a neurotic mother!! I know he will sit but in the interest of better photo’s I really wish he’d get a move on!!! Anyway..he weighed a massive 19lb 15oz!!!!! Thats now more than Caitlin at age 2!!!! I’ve also just packed away his 9-12 month vests and he is in mostly 9-12 month jeans but also one 12-18 month pair!!!!!! He really is a monster…but not as chubby as Noah, longer I think. He’s started eating but will only take puree’s. The second anything with any texture like porridge goes in his mouth he gags and is sick!!! But at least now he is eating something he is back to sleeping through…. And hopefully soon he’ll be onto finger food and will be able to join in meal times. For a long time Noah has had many stupid moments…usually resulting in injuries!! Today while messing around under the guise of eating his tea he bit a (sharp) chunk out of a plastic spoon!! (remember we have no kitchen or sink so we are using plastic cutlery and plates!!) I heard him bite it and when he took it out of his mouth a bit was missing so I told him to spit it out…. But no just as I stuck my fingers near his mouth he swallowed it!!!!!!! Cue lots of gagging and threatened puking… I hit him on the back….just to dislodge the spoon not because he is an idiot honest!!!! Then I stuck my fingers down his throat to try to get him to puke it back up but no joy… So now we have to wait and watch for it’s exit!!!!!!!!!!!!!!! We’ve also still been really busy with our Christmas preparations…more to be revealed along the way!!! Also me and Caitlin have been busy making her birthday present she was given. She got a kit to make your own doll, which we have finished but I’ve saved the photo at the old house so that’s to follow. It’s very cute, Caitlin has called her Abigail and she has a really lumpy head because it’s very hard sewing a smooth curve with a 4 year old but it adds to her character!!!! And here she is!! Kitchen is still in progress and will be for quite a while! We have a cooker but no where to really prepare anything so still not great, but we’re surviving!! We’ve been busy working on Christmas “things”…I can’t reveal what but here’s a little clue…..
…we’ve also been using glue and glitter and wool……….. That’s all you’re getting for now!! It’s out!!! I can’t believe Austin has a tooth!!!! The others didn’t get theirs til 9 months….. I don’t know brown hair, early teeth…what next? I expected Austin to just follow suit with the other 2 they are so similar!!! I told Caitlin and Noah that once the new house was all sorted they could invite people for a sleep over!! Now that we have moved in they have been obsessed by sleep overs and keep asking to sleep in each others beds…so last night I let them have a “sleep over” in Noah’s room…..
Amazingly they stayed like this all night and only woke up at 5.45am which isn’t bad for 2 people crammed into a cotbed!! They also went straight back to sleep when I told them to…. 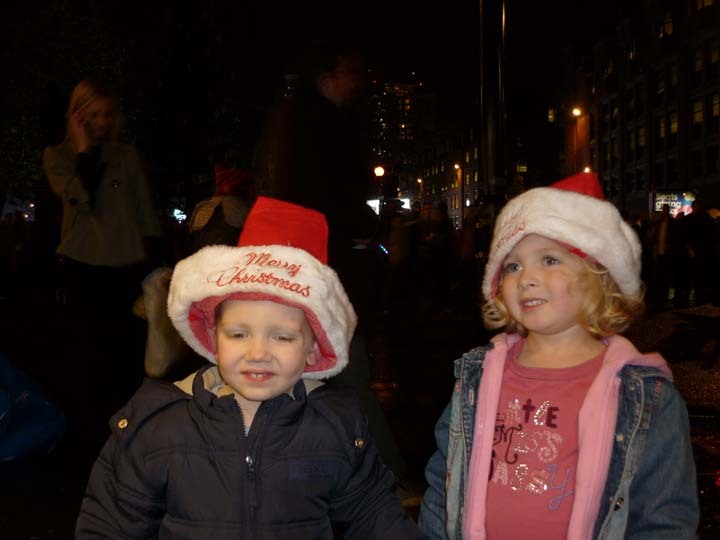 Last week I took Caitlin, Noah and Austin to watch the Christmas lights switch on!! I’m not sure if braving the crowds with all 3 of them alone was brave or stupid…. I had Caitlin and Noah in the pram and Austin in the sling. We had a fantastic spot to watch the lights, a really clear view of the big screen and also a clear path through to where the fireworks get set off from. We were backed up against a shop window so no-one shoving us from behind! We saw Alexandra from the X-factor and a choir, then Caitlin decided she needed the toilet…so it was bye bye to our good spot and we were relegated to the very edge of the crowd down a side street. We just about got to see the fireworks and we could hear the entertainment. Austin LOVED the fireworks…he was following them all…. 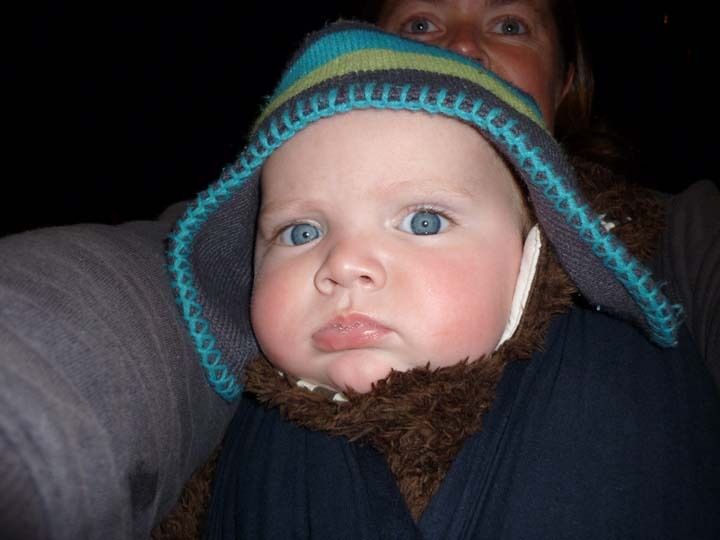 …just look at those chubby cheeks! Caitlin and Noah also liked the fireworks but were really tired by the end and Caitlin fell straight asleep once they were finished! Over the weekend we went around to one of Caitlin’s school friends to play. That was really nice as she’s a lovely little girl and her and Caitlin get on really well. Austin was really grumpy though, but it turns out he has a tooth coming through! Caitlin and Noah didn’t get theirs until around 9 months so that was a surprise!! It’s not quite out yet but will be very soon! ….we have been deliberating for weeks about which school’s to apply for for Caitlin…. We are very lucky in that all of the school’s near to us are fantastic and so realistically we would be happy for them to go to any of them (apart from one which we are fairly unjustified in not wanting..it also has good results!) We visited our 2 closest school’s and liked both for different reasons…. school A was initially our favoured school….it has slightly better results and we know lots of people who go there and are very happy. School B I didn’t expect to like but we did, it also has good results just not quite as good as A but still very good and it’s our catchment school. We think Noah would be better off at school A and Caitlin should be ok at either so we have put school A as our first choice and B as our second. It is advised you put 3 choices so we have put the local Catholic school as our 3rd choice. Now comes the very long wait until March to find out which we have got…..